Presenting a handpainted Breast Cancer Awareness frosted pink ribbon Christmas tree ornament with authentic Swarovski rhinestones. Please note: A limited edition Breast Cancer Awareness rose pink ornament with authentic crystal and pink Swarovski rhinestones is also available. Ornament also available on a solid rose ball with a crystal rhinestone ribbon. Make sure you view our other frosted ornaments. Breast Cancer Awareness Christmas tree ornaments handpainted with authentic Swarovski rhinestones can be purchased at Designer Ornaments. 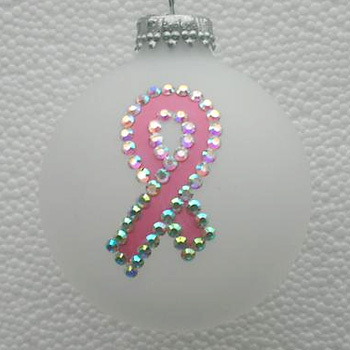 Breast Cancer Awareness Christmas tree ornaments depicting a pink ribbon can be purchased at Designer Ornaments.